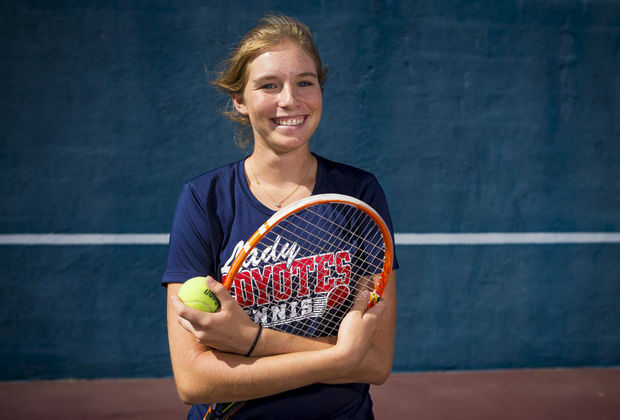 Chloe Weihs has logged over 500 matches as a junior tennis player, starting her tournament experiences from the tender age of nine years old. A fixture in junior draws for much of the last decade here in the Southwest, Weihs is moving on this fall from the junior to the college ranks. We recently visited with the 18-year-old Weihs to reminsice a little about her early junior days, and to see what's in store for her. USTASW: So how exactly did you get started with tennis? CW: My mom was a tennis player and she wanted me to play. She started me with a tennis ball hanging from the ceiling fan when I was just one year old. I started taking lessons with a teaching pro here in town, Jon Perran, when I was 8. I played my first tournament a year later. Been playing a big part of my life. .
USTASW: What has been your best tournament experience since you began competing? CW: I have had some great experiences in tournament tennis. I have made some great friends and learned a lot about myself. The best tournament for me was when I won the SW Closed in 2008 at 10 years old. It was the first big tournament and I didn’t really even know what it meant at the time. The overall best experience I have had in junior tennis was the WTT Junior Nationals ievent in San Diego that I've been able to participate in the last two years. I got to know some great people (like Billie Jean King!) and players from the section in a team atmosphere where we were cheering each other on to victory, as opposed to competing against one another. USTASW: What was your very first USTA Southwest tournament? How old were you? How did you feel approaching the match? CW: My first tournament ever that I played I was 9 years old, and I was also on a basketball league team that same day. I played Sabrina Barkdull in my first match, then played my basketball game and then returned back to the tournament for another match. I don’t remember being nervous, but I do remember being tired. USTASW: What's your ultimate goal with tennis? CW: My ultimate goal has always been to play in college and to have fun being on a team. I’ve had some injuries throughout the juniors (torn meniscus last year), so I would also like to stay injury free during my college years. CW: I like to read and I love to learn. I've really liked school. Now that I am not playing as many tournaments, I am enjoying other sports and exploring the wilderness through camping and hiking. CW: I admire a lot of players, especially the ones who work hard and go about their business without drama. I really like Stan Wawrinka. It would be fun to hit with some of the top players just to see how good they really are and to try and hang in a rally. USTASW: Have you played in any ITF junior or women’s professional events as a junior? Also, what's been your favorite destination/tournament? CW: I haven’t played any ITF events, but I have traveled quite a bit for tennis. One summer, I was able to train in Florida with a former coach. I stayed in a house with a couple of other girls from the section and we had a blast. We played tournaments every weekend and played every day. Living on my own was a good experience and I learned a lot. USTASW: You head to college next year. Are you excited about that and looking forward to that experience? CW: I will be attending University of Indianapolis this fall The team is really good and I like both the girls I've met and the coach. I won’t declare a major course of study because I really want to explore all interests. I kind of wanted to go far away and to experience the seasons and I am looking forward to a cold and snowy winter.